This is the new Aeroplus RC Ti Trainer PNP! Pre-installed Futaba full size servos , 5050-500KV brushless outrunner motor, 80 AMP ESC all installed! No glue is needed for the initial build! Just Screw on the landing gear, screw on the tail section and install your receiver! BIG indestructible wheels gives you a wide choice of runway options! 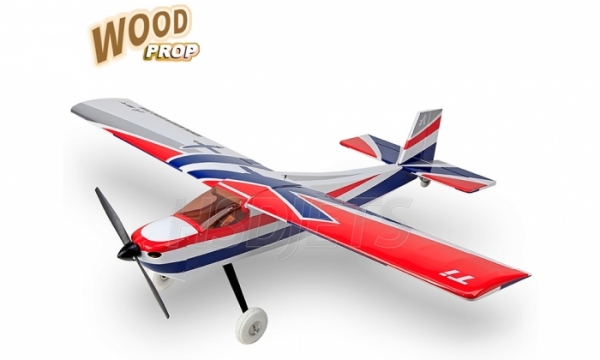 Super smooth flying character gices this Ti Trainer a relaxing flight feel. When you are ready, Ti Trainer can turn up the performance and perform many 3D maneuvers! Beautiful covering and all laser cut wood with precision ball end pushrods and aluminum control surface arms. Wings are using a care free plug system and a single wing bolt thumb screw for each side. Battery can range from a 6s 3000 to 4500. 3300mAh is the best size for sport flying and light 3D. Tons of vertical power and just super fun to fly! Pushrods are installed and centered right out of the box! This Ti trainer can be flight ready from out of the box to flying in less than 15 minutes! Super easy assembly, Ready to fly in minutes!